Storr, Robert. Gertrude Abercrombie. 2018, p. 334, color illus. Cozzolino, Robert. With Friends: Six Magic Realists: 1940–1965. Madison, Wisconsin: Elvehjem Museum of Art, University of Wisconsin-Madison, 2005, b/w illus. p. 81, pl. 17. Weiniger, Susan and Kent Smith. Gertrude Abercrombie. Springfield, Illinois: Illinois State Museum, 1991, color illus. p. 63. With Friends: Six Magic Realists: 1940-1965, Elvehjem Museum of Art, University of Wisconsin-Madison, June 18–September 18, 2005. 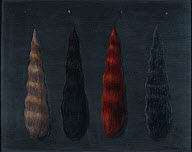 Gerturde Abercrombie, State of Illinois Art Gallery, Chicago, March 18–May 17, 1991; Illinois State Museum, Springfield, Illinois, July 28–October 25, 1991.